Hi friends! As you guys know by now, I'm not a fan of vegetables. Well, I wasn't a fan of vegetables. I think that is changing though. What!? It's true and it's a beautiful thing. I've been trying to think of new snacks that I can take with me to my "real job" lately because a person can only eat so much dried mango before they either begin to hate mango or go broke trying to buy enough mango to sustain the habit. 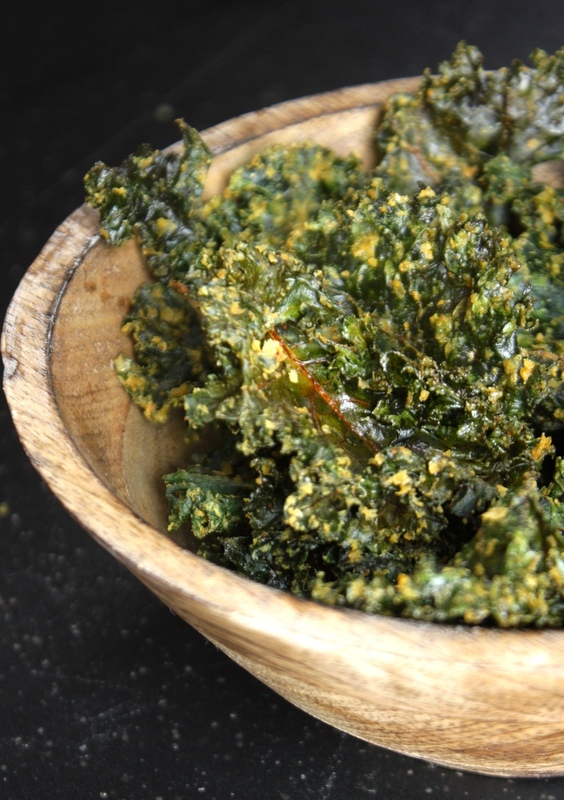 So here we are with a pretty addictive recipe for kale chips. I believe that our tastebuds are able to be altered with a bit of persistence and influence from ourselves. I know that sounds crazy but hang with me for a second! I used to be someone who wouldn't touch any fruits or veggies ever. That's not an exaggeration either. Eventually I began to get more into health and fitness and slowly but surely things started changing. I still can't eat a banana in it's natural state but I can easily eat 10 of them blended into a smoothie. That doesn't make sense, I know. That's how it is though! Basically, if your tastebuds are used to eating nothing but processed foods, then that's what they'll like. That doesn't mean that your destined to eat those foods forever. If you slowly start to make the changes then your body will get it and before you know it you'll be craving kale chips instead of packaged goodies. Try new things, experiment, have fun! I'll help you get started! Preheat your oven to 300F degrees. Place kale leaves (make sure to get out any of the thick stems!) into a large bowl. Pour coconut oil on top of kale and massage it to coat it evenly. Add in nutritional yeast, salt, and pepper. Massage kale to evenly distribute toppings. Spread kale out on a parchment paper lined baking sheet. Bake for 15-20 minutes until kale is crisp. Remove from oven. Cool. Serve, enjoy!